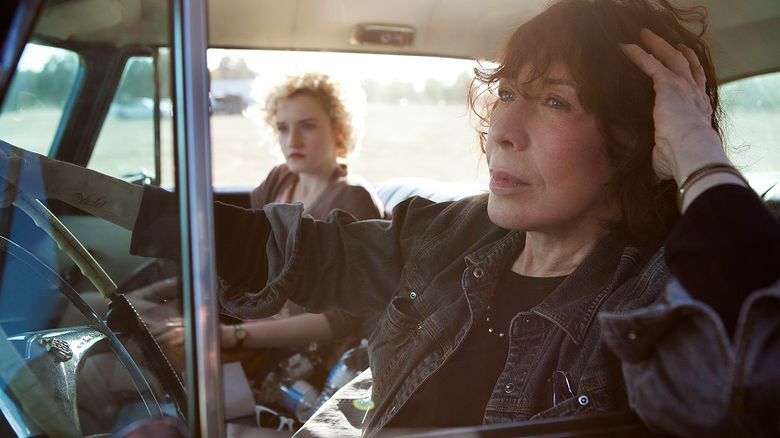 A quirky road movie that’s a comedy with moments of wrenching drama, led by the great Lily Tomlin. Rated 3½ stars out of 4. Lincoln Square, Guild 45th. Short, tart, yet unexpectedly sweet, Paul Weitz’s “Grandma” is a small-scale character study — and, because that character is played by the great Lily Tomlin, it’s mesmerizing, right up until its final frame. Tomlin, who has an uncanny way of making her characters all of a piece (the same low, wry voice; the same fierce squint; the same funny twist of a line, like squeezing a lemon) and yet utterly distinctive, plays Elle Reid, a California poet and failed academic who’s having a pretty bad day. First thing in the morning, she cruelly breaks up with her much-younger lover Olivia (Judy Greer); calling her “a footnote.” Then, after sobbing in the shower (we know, immediately, these tears aren’t for Olivia), Elle’s 18-year-old granddaughter Sage (a terrific Julia Garner) shows up at the door, needing $600 before the end of the day for an abortion. As the film progresses, “Grandma” becomes a road movie, with Elle and Sage visiting various people in their lives in the hope of scrounging up the money. (Elle, who just paid off all her bills, can’t give it to Sage, as she’s cut up her credit cards and made a wind chime out of them. “I’m transmogrifying my life into art,” she says, in gruff self-mocking.) And we learn, along the way, that Elle’s still in desperately sad mourning for her longtime partner Violet, who died a year and a half ago; that Elle never hesitates to speak her mind, no matter who might get hurt along the way; that she’s estranged from her businesswoman daughter Judy (Marcia Gay Harden) for a number of complicated reasons; and that Elle loves her granddaughter deeply, though she wouldn’t dream of saying it. It’s a comedy, but there are moments of wrenching drama, most notably with Sam Elliott as a flame from long ago who’s never forgiven Elle — or forgotten her. (He also, in this film’s quirky fashion, greets Elle and Sage with a breezy, “Want some zucchini?”) But this is Tomlin’s movie — Weitz wrote the character of Elle for her — and it’s a rare pleasure to watch her front and center, telling a story with every line. This woman is a misanthrope, and revels in it; but watch how Tomlin, through a touch on the back, a microscopic smile, a look of quiet regret, makes Elle something richer and more complicated. By the end, she hasn’t become any nicer, but she’s made a few things a little more right, and she’s laughed — and we laugh, with her. ‘Grandma,’ with Lily Tomlin, Julia Garner, Marcia Gay Harden, Judy Greer, Laverne Cox, Sam Elliott, Nat Wolff. Written and directed by Paul Weitz. 80 minutes. Rated R for language and some drug use. Lincoln Square, Guild 45th.